INS Vikramaditya (R33) with a Sea Harrier aircraft in the Arabian Sea. It is the Indian Navy's largest aircraft carrier. In most nations, the term "naval", as opposed to "navy", is interpreted as encompassing all maritime military forces, e.g., navy, marine / marine corps, and coast guard forces. Naval warfare developed when humans first fought from water-borne vessels. Prior to the introduction of the cannon and ships with sufficient capacity to carry the large guns, navy warfare primarily involved ramming and boarding actions. In the time of ancient Greece and the Roman Empire, naval warfare centered on long, narrow vessels powered by banks of oarsmen (such as triremes and quinqueremes) designed to ram and sink enemy vessels or come alongside the enemy vessel so its occupants could be attacked hand-to-hand. Naval warfare continued in this vein through the Middle Ages until the cannon became commonplace and capable of being reloaded quickly enough to be reused in the same battle. The Chola Dynasty of medieval India was known as one of the greatest naval powers of its time from 300 BC to 1279 AD. The Chola Navy, Chola kadarpadai comprised the naval forces of the Chola Empire along with several other Naval-arms of the country. The Chola navy played a vital role in the expansion of the Chola Tamil kingdom, including the conquest of the Sri Lanka islands, Kadaaram (Present day Burma), Sri Vijaya (present day Southeast Asia), the spread of Hinduism, Tamil architecture and Tamil culture to Southeast Asia and in curbing the piracy in Southeast Asia in 900 CE. In ancient China, large naval battles were known since the Qin Dynasty (also see Battle of Red Cliffs, 208), employing the war junk during the Han Dynasty. 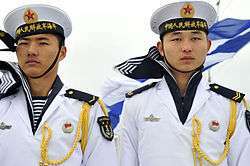 However, China's first official standing navy was not established until the Southern Song dynasty in the 12th century, a time when gunpowder was a revolutionary new application to warfare. The first practical military submarines were developed in the late 19th century and by the end of World War I had proven to be a powerful arm of naval warfare. During World War II, Nazi Germany's submarine fleet of U-boats almost starved the United Kingdom into submission and inflicted tremendous losses on U.S. coastal shipping. The German battleship Tirpitz, a sister ship of the Bismarck, was almost put out of action by miniature submarines known as X-Craft. The X-Craft severely damaged her and kept her in port for some months. World War II also saw the United States become by far the largest Naval power in the world. In the late 20th and early 21st centuries, the United States Navy possessed over 70% of the world's total numbers and total tonnage of naval vessels of 1,000 tons or greater. Throughout the rest of the 20th century, the United States Navy would maintain a tonnage greater than that of the next 17 largest navies combined. During the Cold War, the Soviet Navy became a significant armed force, with large numbers of large, heavily armed ballistic missile submarines and extensive use of heavy, long-ranged antisurface missiles to counter the numerous United States carrier battle groups. Only 3 nations (United States, France, and Brazil) presently operate CATOBAR carriers of any size, while Russia, China and India operate sizeable STOBAR carriers (although all three are originally of Russian design). The UK is also currently constructing two Queen Elizabeth class carriers, which will be the largest STOVL vessels in service, and India is currently building two Vikrant-class aircraft carriers (the second one with CATOBAR technology) and considering another. France is also looking at a new carrier, probably using a CATOBAR system and possibly based on the British Queen Elizabeth design. US Navy officers aboard the aircraft carrier USS Abraham Lincoln (CVN 72) monitor defense systems during maritime security operations. Navies may conduct military operations other than war. INS Shivalik is a stealth frigate of the Indian Navy. In the majority of countries, the marine force is part of the navy. The United States Marine Corps is a separate armed service within the United States Department of the Navy, with its own leadership structure. ↑ Found on the KN U 736, PY Na 568, PY Vn 865 and PY Xn 990 tablets. Cf. ναυπηγός. ↑ Harper, Douglas. "navy". Online Etymology Dictionary. ↑ navigium. Charlton T. Lewis and Charles Short. A Latin Dictionary on Perseus Project. ↑ navis. Charlton T. Lewis and Charles Short. A Latin Dictionary on Perseus Project. ↑ navalis. Charlton T. Lewis and Charles Short. A Latin Dictionary on Perseus Project. ↑ ναῦς. Liddell, Henry George; Scott, Robert; A Greek–English Lexicon at the Perseus Project. ↑ ναύτης in Liddell and Scott. ↑ "The Linear B word na-u-do-mo". Palaeolexicon. Word study tool of ancient languages. ↑ Raymoure, K.A. "na-u-do-mo". Minoan Linear A & Mycenaean Linear B. Deaditerranean. ↑ "KN 736 U (unknown)". "PY 568 Na (1)". "PY 865 Vn + fr. (Ci)". "PY 990 Xn (unknown)". DĀMOS: Database of Mycenaean at Oslo. University of Oslo. ↑ "NATO Review - Vol. 49 - No 2 - Summer 2001". ↑ "LINGUIST List 26.1302: Sum: Summary of Etymology of the Latin word 'navia'". The LINGUIST List.